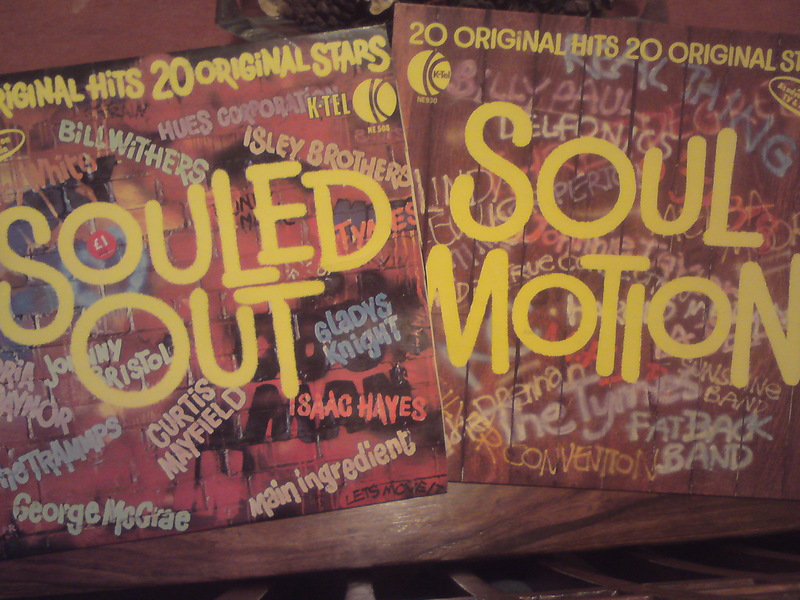 Goddamit, I’ve been after that Super Bad elpee for ages, for no other reason than I want to complete the set, reuniting the record with it’s younger brothers Souled Out (NE 508, 1975) and Soul Motion (NE 930, 1976). I remember this album being advertised on TV–“bad” ironically meaning good was something I couldn’t quite get my young tow-headed head around. When I was visiting Washington D.C. last year, the Smithsonian Institution had an expanded CD version of this, now iconic, Lp for sale. 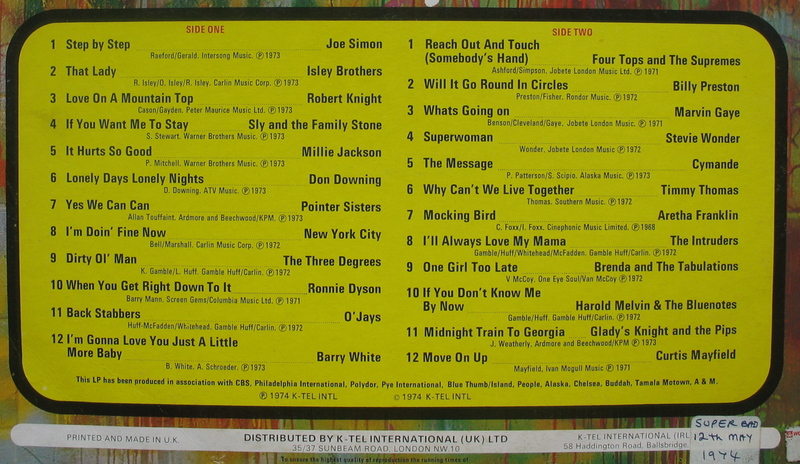 Check out that tracklist, homeeze; instant party at only 2p a song–beat that I-freakin’ Tunes. 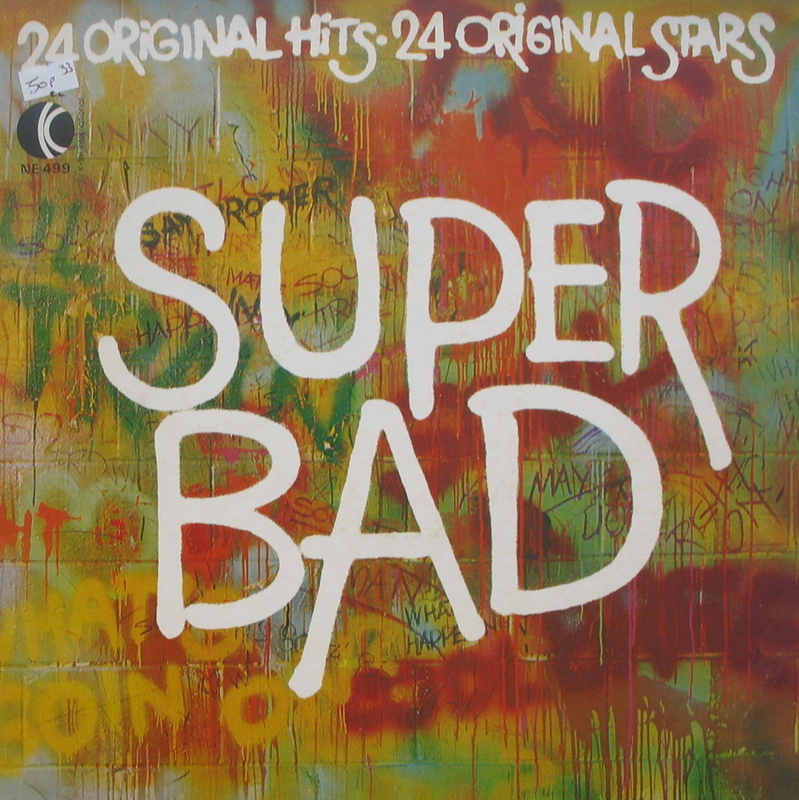 EDIT: here’s the 1973 US Super Bad (K-Tel NU427) tracklist for contrast and compare fun. I can only assume the differences are based on chart position. “George Hurrell took the Cover Photograph with the same box camera he used in Hollywood in the thirties.” Though none of the pictures he took then involved men wearing mullets. Believe it or not, there are plenty of Beatles Related holes in my record library and not just The Chipmunks Sing The Beatles Hits sized ones. This much maligned (by me among others) mid-80s Paul McCartney release, his 6th solo studio album, is just the sort of music that I’m happy, through the miracle of Smeeth Boot Fair, to reappraise. The last time I heard Press To Play was when I borrowed the CD sometime in the early 90s to aid in the compiling of a definitive series of Macca cassettes for myself. In the event, I only chose one track. However, in 2011, I’m pleased to report that things open surprisingly strongly. 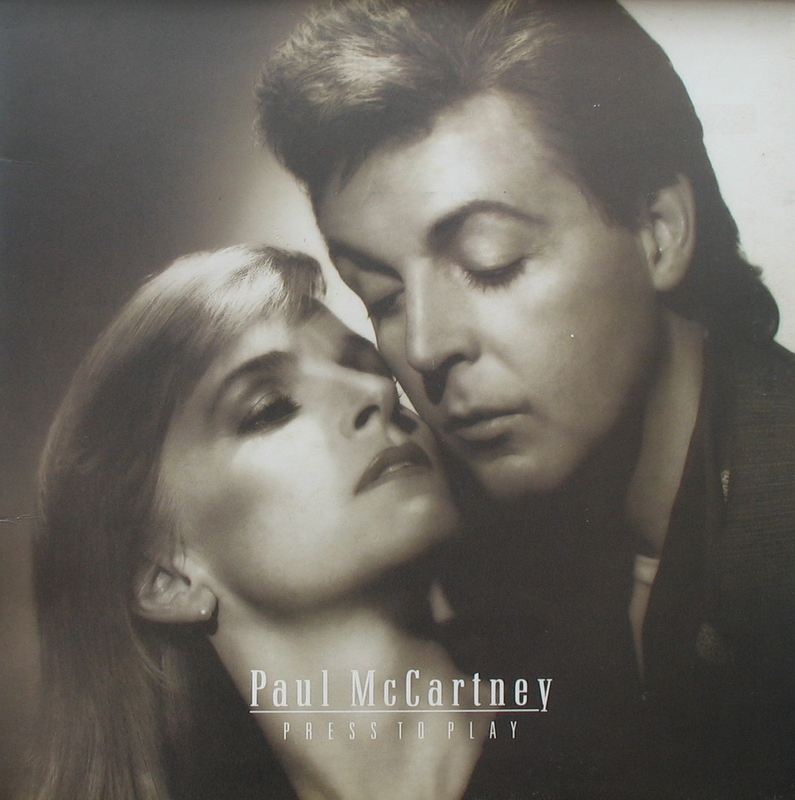 Side one shows plenty of melodic and production invention (yes, loud drums do feature; Hugh Padgham was the co-producer, after all), Paul regularly employing a supple falsetto to pleasant effect, culminating in a couple heartfelt ballads. Inspiration starts to wane on the second half with the previously discussed title track, half-baked electronica and petulant “rocking” nearly sinking proceedings till a late lucky strike saves the day. I can’t imagine haters finding much to like here, but lovers will find much to rediscover and enjoy. 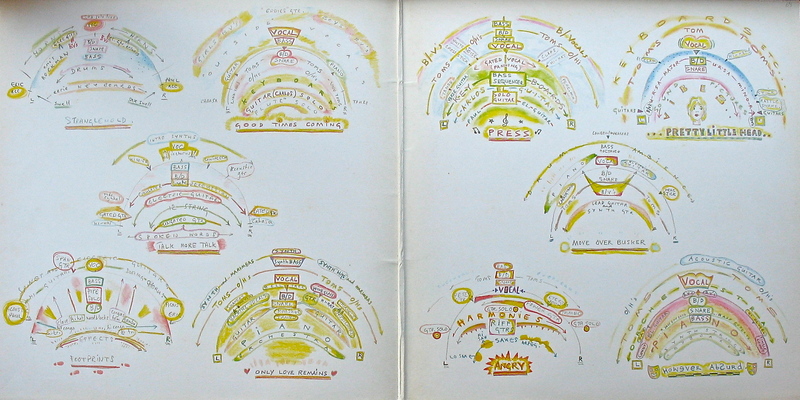 Heaven forbid anyone should listen to music unironically, so here’s 59 penn’orth of MFP cheese-tastic ’63/’64* Beatles cast-offs and low hopers that still managed, despite the apparent insanity of the Fourmost and literally rhyming “June light” to “moonlight”, to be hits. 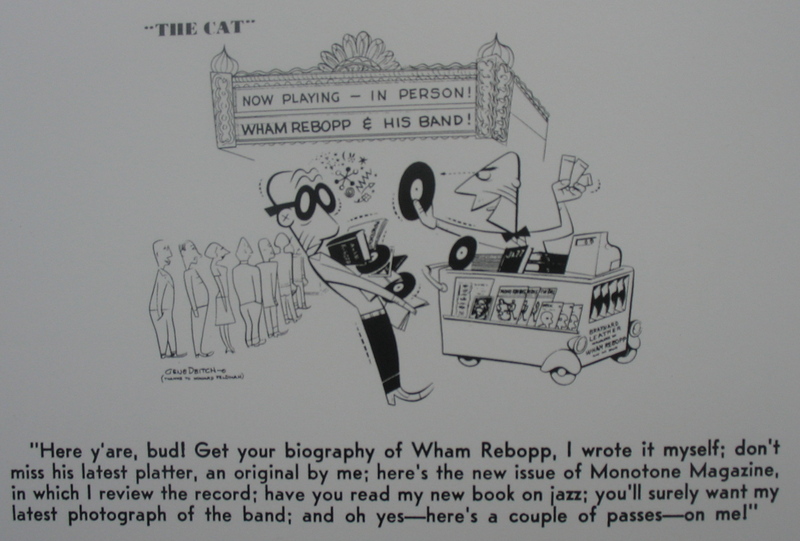 The particular appeal of this record to the Beatles fanatic however is the preponderance of L&M songs not commercially available by the band during its lifetime: “Bad To Me”, “I’ll Be On My Way” and “I’ll Keep You Satisfied” by Billy J. Kramer, “I Don’t Want To See You Again”, “World Without Love” and “Nobody I Know” by Peter & Gordon, and “Hello Little Girl” and “I’m In Love” by the Fourmost. All I need is a Volume 2 with Billy J. Kramer’s “From A Window”, Peter & Gordon’s “Woman”, Applejack’s “Like Dreamers Do”, P.J. Proby’s “That Means A Lot”, The Strangers’ “One and One is Two”, Tommy Quickly’s “Tip of My Tongue”, and Chris Barber’s ” Catcall” plus a few of the other floor sweepings from the lamer corners of the Fabs’ mansion for my life to have meaning. NB: I’ve already got the relevant Cilla tracks here. For even greater cheap thrills, I wish my copy had come in this Dutch cover. *the two exceptions are “When I’m 64” by Bernard Cribbins and “She’s Leaving Home” by David & Jonathan. Yay! Been after this one for quite a while, actually. 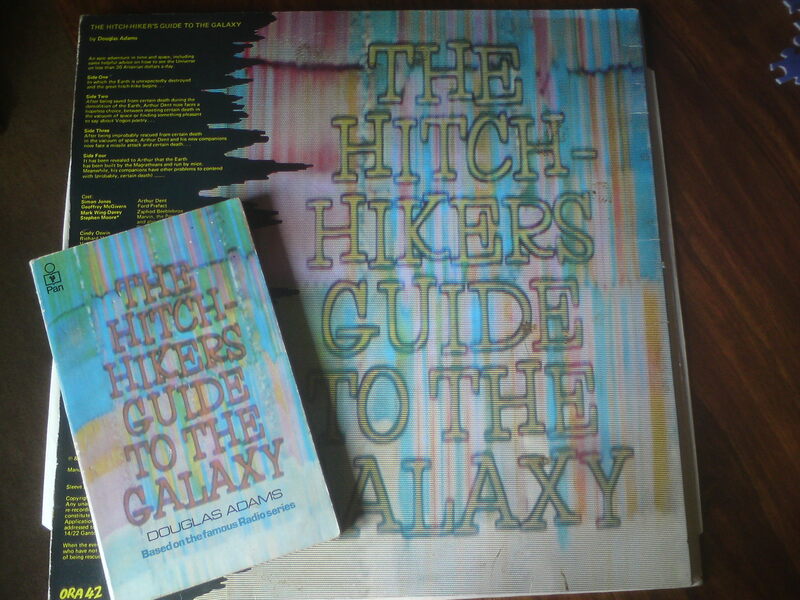 After the original Radio 4 series, but just before the BBC2 TV series, came this specially-recorded double-vinyl gatefold version of Douglas Adams’ brilliant Hitch-hikers Guide To The Galaxy, recorded July-August 1979 with music by Tim Souster and the Radiophonic Workshop’s Paddy Kingsland. 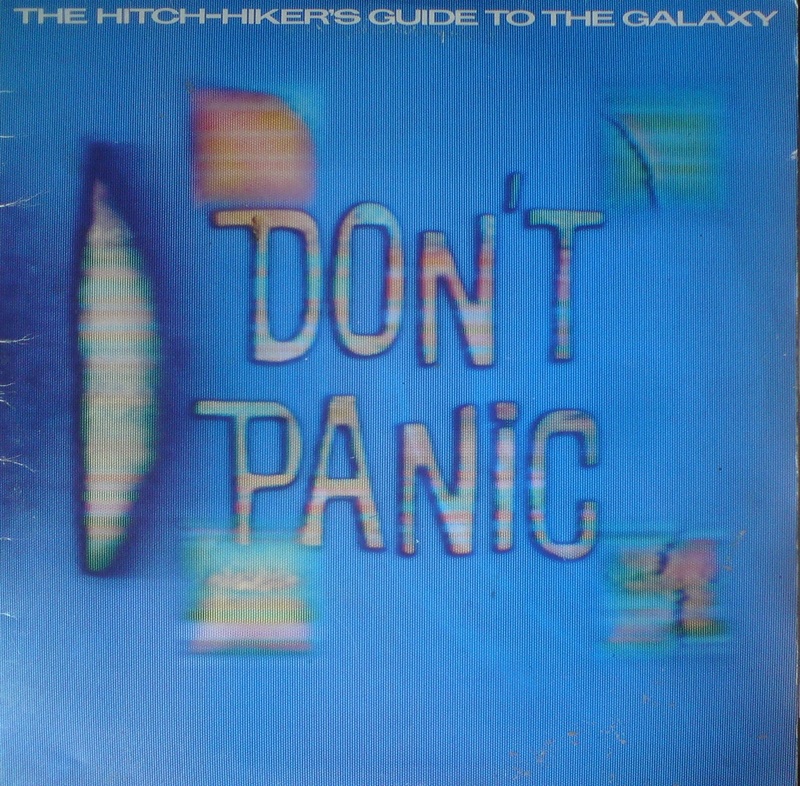 Sleeve design by Hipgnosis, featuring the same graphics as the Pan paperback edition from the same period, which I can still remember buying with my pocket money for 95p in the gift shop of a campsite in Charmouth in 1980 (and I still have the book – see above pic). And yes, I know there’s a second volume, I already thrifted that one yonks ago. 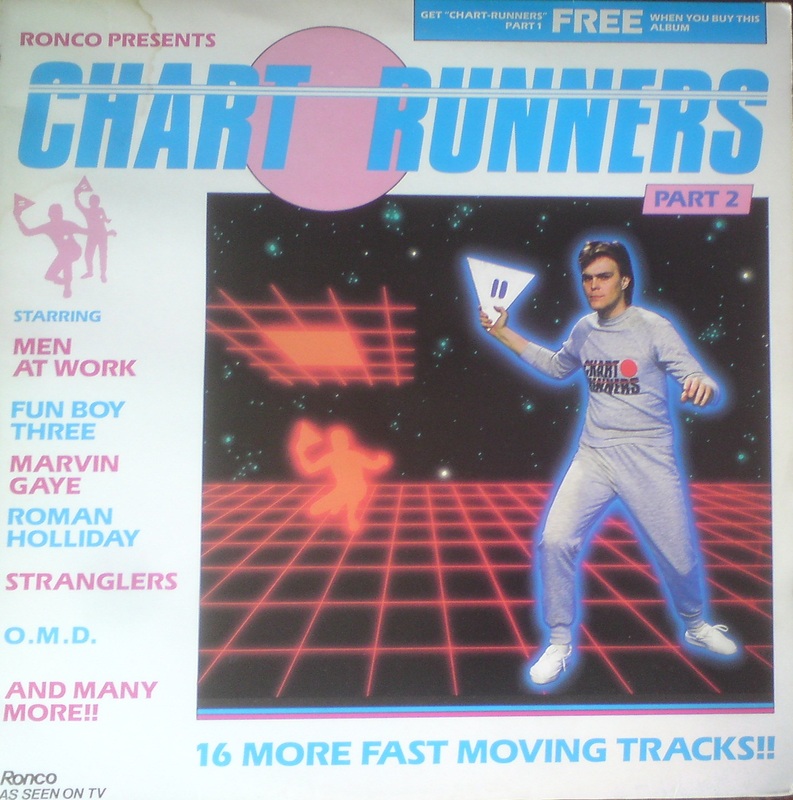 Just in case readers were thinking this was now only a place for ‘serious’ vinyl appreciation, here’s some fresh Ronco action from that most forgettable of years, 1983. 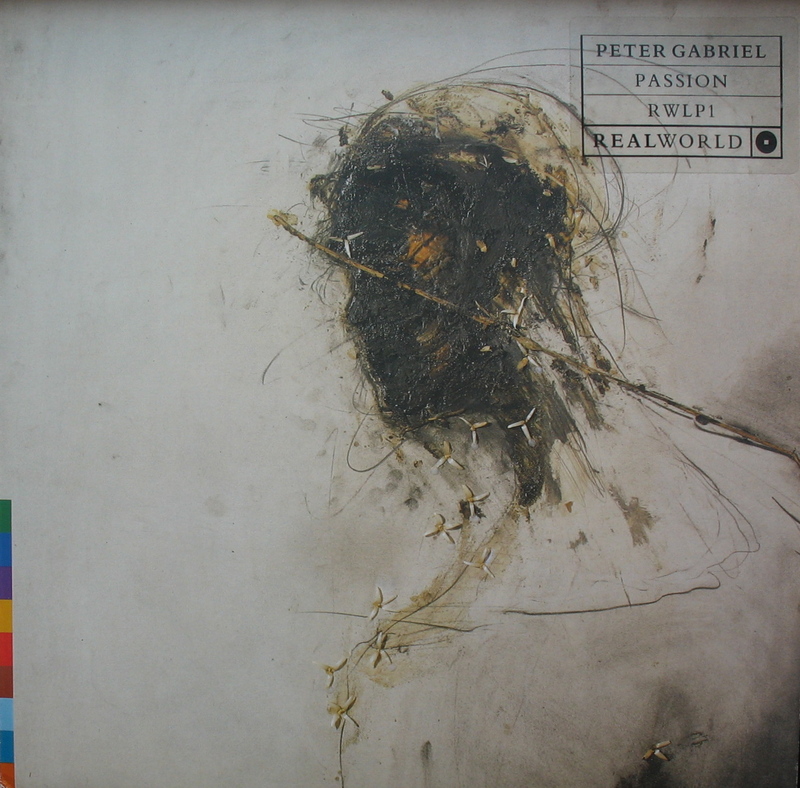 Worth the price of admission for the post-‘Tron’ sleeve design, but also the typical blend of overly-familiar pop picks (‘Down Under’, ‘Sexual Healing’), nice-to-be-reminded-of chart hits (‘Tunnel Of Love’, ‘Heartache Avenue’, ‘European Female’) slightly left-of-centre noble failures (John Foxx’s ‘Endlessly’, Shriekback’s ‘Lined Up’), briefly popular discotheque hits that failed to cross-over to the charts (Mahagonay’s “Ride The Rhythm”), complete euro-twaddle (“A Cha Cha At The Opera”) and let’s just forget White & Torch’s disastrous “Let’s Forget”. Okay now I’m on a mission to find ‘Part 1’…. About a month ago I found the Last Temptation of Christ double Lp soundtrack in Ashford and hadn’t got around to listening to it, something about being in the right mood. I had the right mood foisted on me when, a couple weeks later at the self-same boot fair, the various artists sister album of “traditional music, sources of inspiration and location recordings” turned up. Despite the titular exhortation to strong feeling, I found hard to get too worked up as I listened to these albums. No doubt made with enthusiastic care and genuine commitment to spreading the word, there’s something off-puttingly colonial about their very worthiness. Is it unfair that my prejudice is somehow restricting potential enjoyment? I will take time to see if I get over this, but it’s possible that these well-produced, well-played, handsome albums simply weren’t made for me, that I require my so-called world music a little more old-school rough and ready in the same way that I’d rather listen to the punk rock of the Stooges than, say, Rancid. 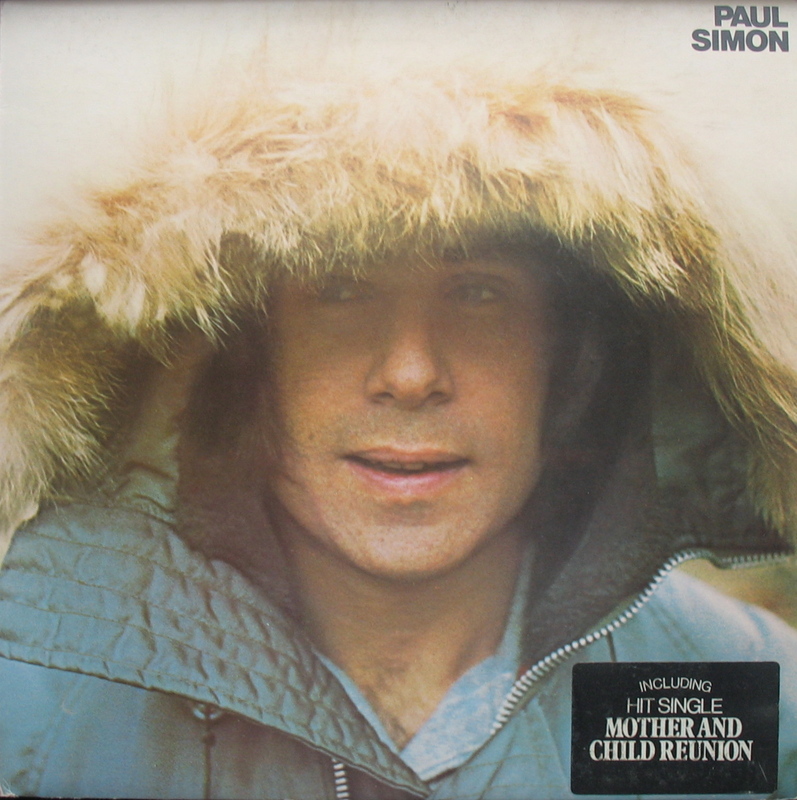 Through careful scripting and attention, Paul Simon’s first post-Garfunkle solo album actually sounds and feels less self-conscious, more mature than S&G. Remarkably, too, proto-forays into world music, “Mother and Child Reunion” and “Me and Julio Down By the Schoolyard” do not come across as patronising or contrived. These are paradoxes. Elsewhere, Simon uses unlikely words like befreinded, destituted, and misinformation and phrases them in such unexpected yet natural ways it amounts to a songwriting and performance masterclass. Acoustic guitar led, Paul’s got the likes of Hal Blaine, Airto, David Spinozza and Larry Knechtel to offer sympathetic, understated support. 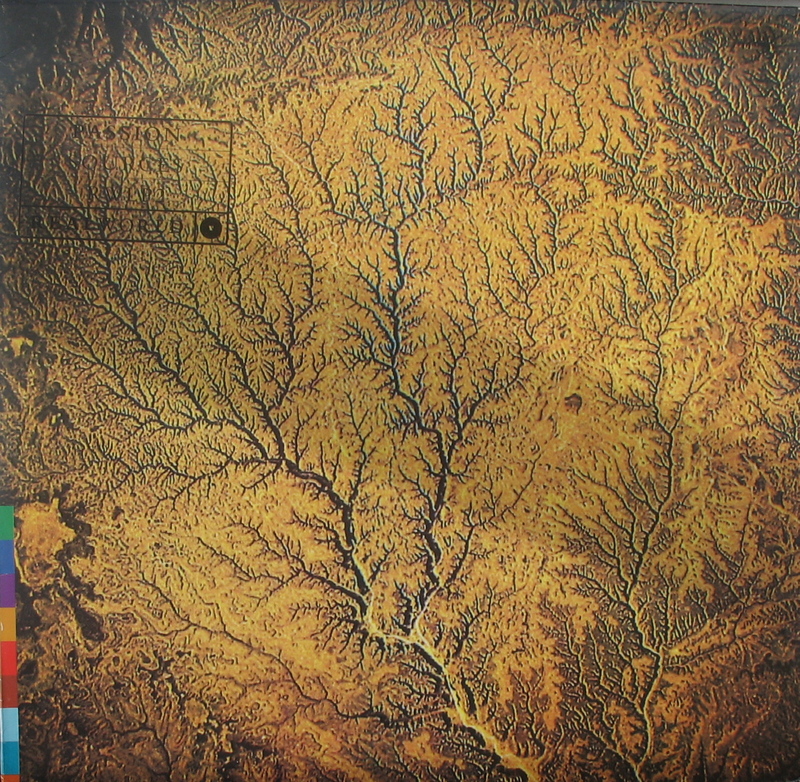 Over the past year, I’ve managed to thrift all three of Paul Simon’s 70s Columbia studio Lps–I can recommend the lot. 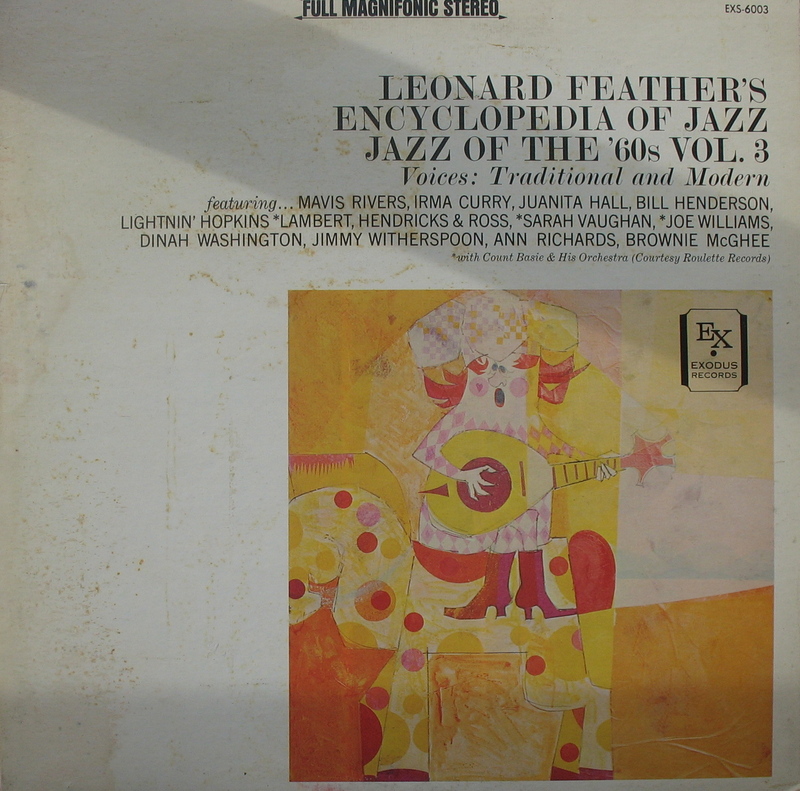 Twenty or so years later, populariser Feather was still hard at it, compiling albums of “borderline jazz” and blues that now define a certain 50s/60s commercial vibe. And in Full Magnifonic Stereo to boot. 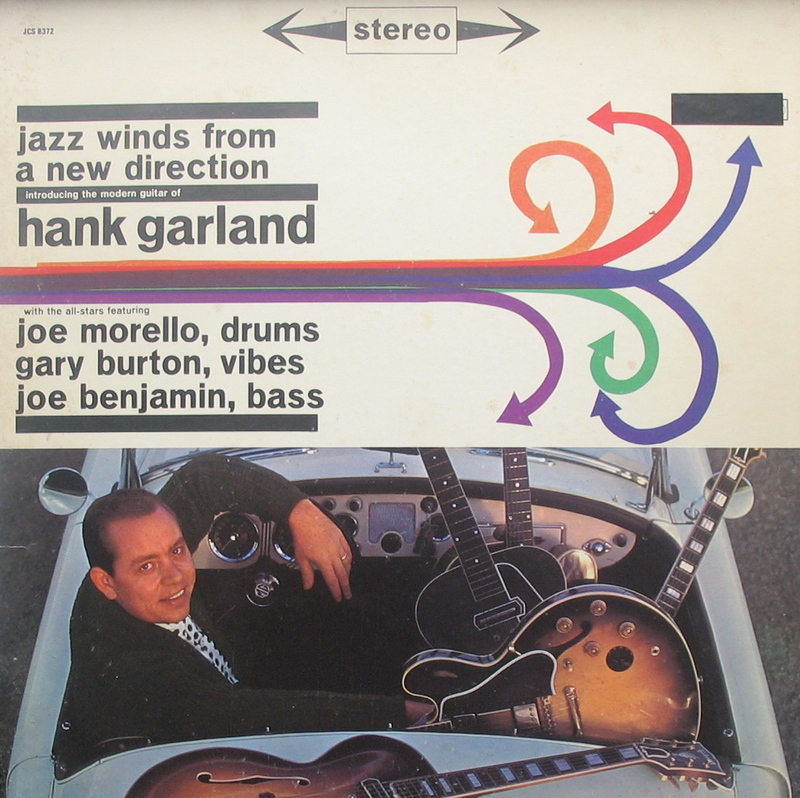 If I were to ask you to imagine what you thought guitar jazz sounded like and you were bereft, I would simply point you in the direction of this 1961 album by quintessential Nashville Cat Hank Garland (Elvis, the Everlys, Roy Orbison, Patsy, ad infinitum) . Choc full of bubbly, hollow-bodied, blindingly fast pointillist lead runs, Garland is matched by teenage vibraphone virtuoso Gary Burton on what must be one of his first on record performances. Jazz Winds‘ rhythm section comes on loan from the Dave Brubeck quartet. What should have been the opening salvo in a long, illustrious career in jazz was in fact a sad last testament to his genius when a serious car accident left the guitarist unable to play at all for some time and never again in the studio. 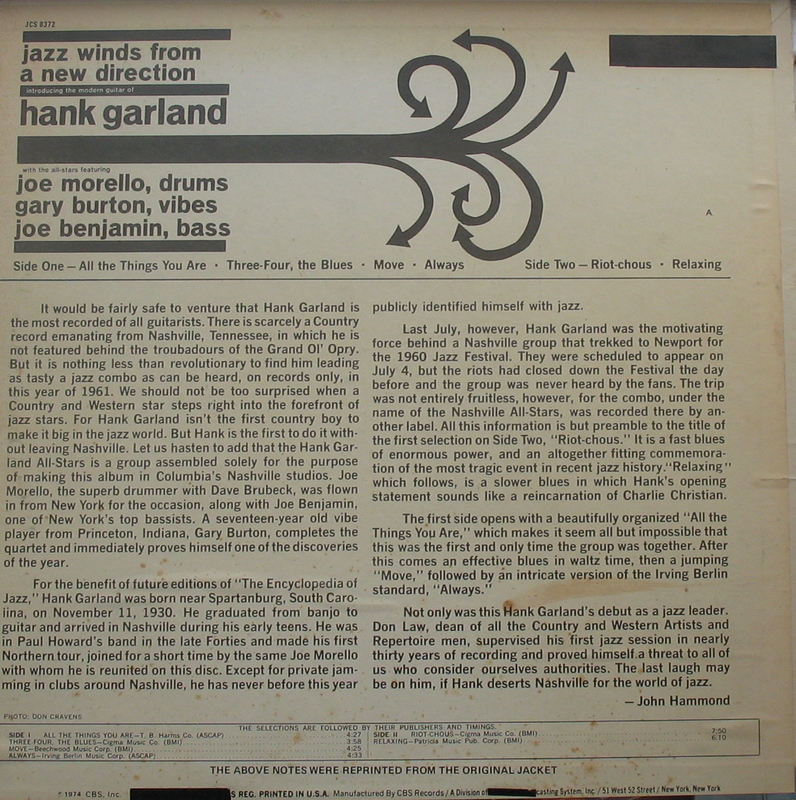 A sweet find, it was the “other album” mentioned in the MJQ post. We’ve all bought reissues where previous label information is obscured, usually where a piece of like coloured art is placed over top during the redesign before printing. 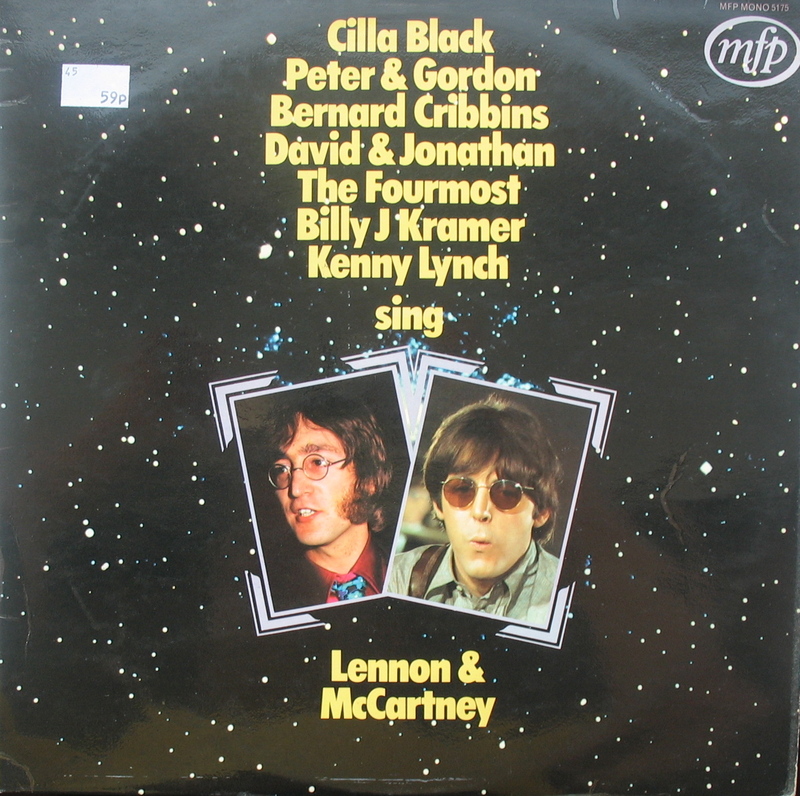 A peculiarity of this 1974 Columbia Special Products (A Service of CBS Records) Collectors’ Series reissue are the extraordinarily inefficient and ugly CIA-style hand-stuck, black-out tape coverings of Columbia logos, etc. on the front and back covers. Given that the record is assembled old-school tip-on fashion, one wonders if they re-used vintage materials. A mystery.